Leslie Stoner is holding a blowtorch in one hand while we chat in her Green Lake studio. She's spraying the torch across the surface of one of her paintings and explaining her process: how the flame heats the wax and fuses it, pushes it down or smooths it out in different ways. 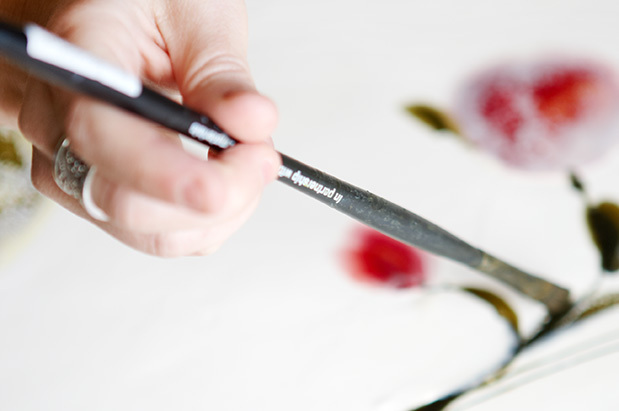 As an encaustic painter—encaustic being an art form whose main medium is heated wax—Stoner utilizes a unique set of tools. In addition to her several blowtorches (which come in a few different sizes), she also uses razor blades, various palette knives, pottery tools and an assortment of baking tins. Stoner spent her childhood years on a mink farm in northwest Montana. She moved to Seattle in 1997. From 2002 until 2006 she attended Cornish College of the Arts, where she earned a degree in painting and photography. 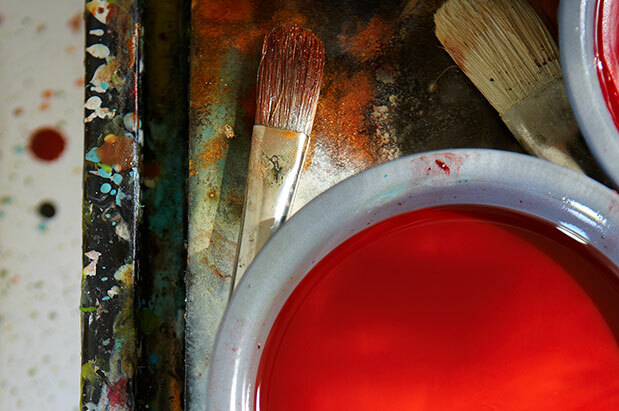 She first tried encaustic painting in 2005, while she was managing the studio of Betsy Eby, another local encaustic artist and one of Stoner’s early influences. Stoner’s work now shows at Abermeyer + Wood Fine Art in downtown, the Seattle Art Museum sales and rental gallery, and Friesen Gallery in Sun Valley. Her studio sits in the back of her home and overlooks a yard full of greenery, including a cluster of bamboo stalks and several shady trees. There’s a transparency print of a barn taped to one of the large windows, and a magazine clipping of an antique-looking woman taped just below that. The window sills are lined with tiny trinkets, each one different and random yet seemingly very important. A minuscule corked bottle of confetti, maybe the size of my thumbnail, rests in front of a tiny candle in a wire candle holder. There’s also a Russian nesting doll, a seashell, a small buddha, and a branch extending up with a hollow bee hive dangling from one of its twigs. But what you notice most is all the color. “Pucks” as Stoner calls them, wax discs each about the size of a creme brûlée, are stacked together on shelves throughout the room. 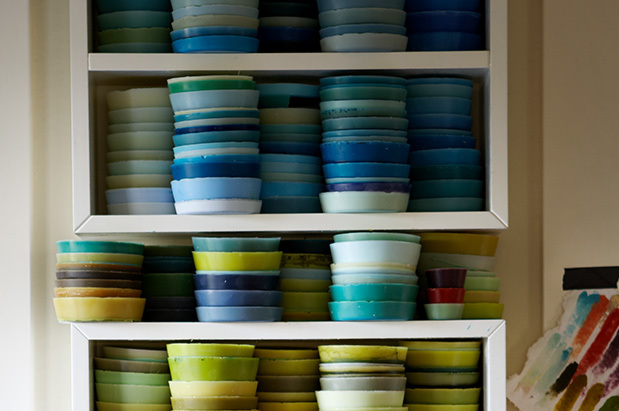 They're organized by color—varying greens, teals, and jades, next to at least 20 different shades of blue. The colors are so numerous that I can't name them all, nor am I sure I've even seen them all before. This is because Stoner makes her own colored wax. 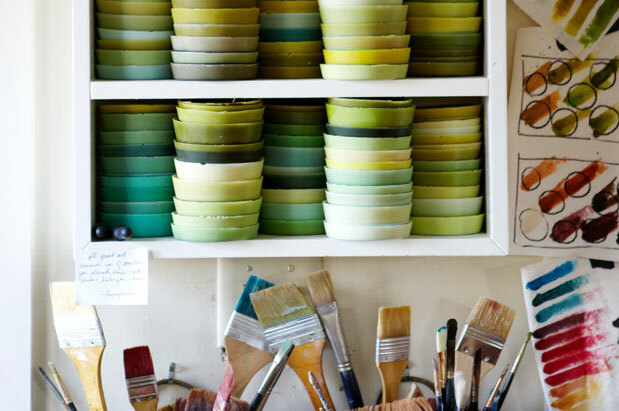 She says many encaustic painters order pre-made colors because working with powdered pigments (one of the necessary ingredients) can be dangerous to breathe in. When she pulls open a drawer full of jars of copper and golden brown pigments, I see the warning labels pasted on at least half of them. To make the wax, Stoner combines the powdered pigments, a colorless beeswax that arrives the consistency of soft sand, and damar, which is a kind of tree sap that she mashes into a powder with a mortar and pestle. 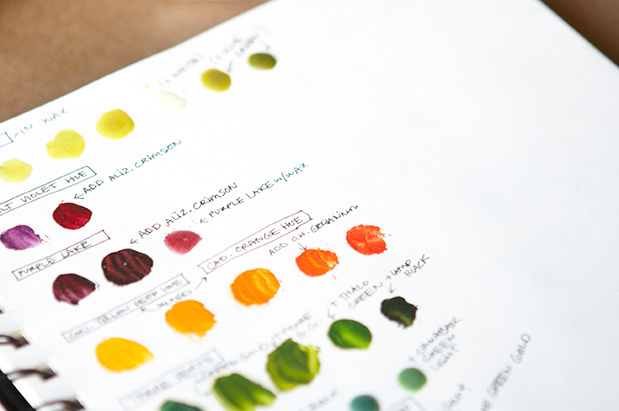 As Stoner mixes a color in a baking tin on one of her hot plates, she takes general notes so she can have an idea of what colors she started with if she wants to use a similar palette in a future painting. Sometimes she measures precisely, but often she doesn’t. The way she talks, you’d think she was a master baker; a little of this color, a little more of that. Go with your gut. Her studio even feels a little like a kitchen. Maybe it’s the bright colors, maybe it’s that her two children are playing in the next room, or maybe it’s the warm late afternoon light, but the space feels both stimulating and comforting all at once. Stoner says her paintings are very much based in nature, but “a nature that you haven’t seen before.” Like the colors she concocts in her studio, her artwork is relatable and vaguely familiar but also a little foreign. “I see my paintings as landscapes or windows into a world not quite ours but still familiar enough to envision yourself in it." If you spend any amount of time with Stoner’s paintings, you start to feel what she's talking about. The layered nature of her pieces gives them the illusion of immense depth. You almost wish you could dunk yourself right into them, to sink your own secrets beneath all that color—in a swirling ring of green or in a bit of orange barely visible under a surface of seething black. Browse Stoner’s portfolio for yourself on her website, or see her work displayed in Abermeyer + Wood Fine Art or at the SAM sales and rental gallery.